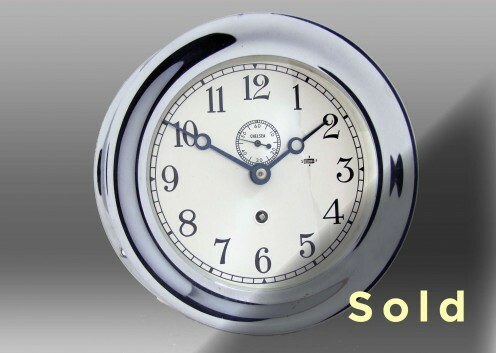 This 6” Marine mechanical clock was originally sold to the Economy Boat Store on April 29, 1964. This clock features a solid forged brass case with a bright chrome finish, a hand-silvered dial with black Arabic numerals and an offset remote sweep. The 16E movement (time-only mechanism) has been completely overhauled, and the case and dial have been thoroughly cleaned and polished.